Pre-existing medical conditions are often excluded from mainstream travel insurance policies, but MediSafe Travel Insurance specialises in this area, meaning that you can buy travel insurance cover for all the conditions that you have - as long as you have a diagnosis. Where ever you choose to go on holiday, travel insurance is vital. MediSafe can insure your trip no matter where you are going in the world, as long as you are not travelling against the Foreign and Commonwealth Office. Travel is almost always exciting, and it's important to us that you can enjoy your trip or holiday safe in the knowledge that you are properly protected by a MediSafe travel insurance policy, with full cover for your medical conditions in minutes. Traditionally annual travel insurance is beneficial if you take more than two holidays in a year. Annual Multi-trip travel insurance from MediSafe covers you for as many trips as you want in a 12 month period, but each trip can't be longer than 31 days. Welcome to MediSafe travel insurance! We specialise in insuring holiday makers who have pre existing medical conditions, and enabling them to enjoy their travels abroad knowing that they have proper travel insurance cover for any medical emergency that may arise while on holiday. Our travel insurance policies allow you to complete a short medical questionnaire online and get an accurate, and great value, travel insurance quotation and buy online, meaning you can get travel insurance for pre-existing medical conditions immediately - buy online and we'll send your policy documents to you by email straight away. 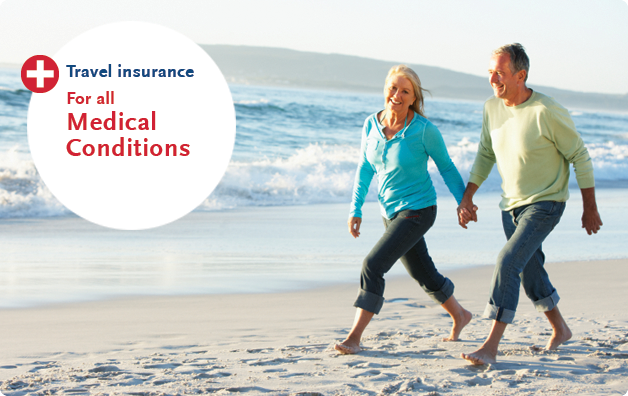 It's never too late to buy travel insurance for pre-existing medical conditions, we can issue cover that starts today.